Nunes, who spent much of 2018 running interference for President Trump to minimize the scope and impact of investigations by the House Permanent Select Committee on Intelligence, was rehearsing the GOP’s main talking point in the 2020 elections, namely slinging the term “socialism” early and often. His pitiful plea about having to request a straw stems from the Republican tenet holding dirty energy production as a benefit while ignoring the ongoing dangers of climate change. And, of course, the Congressman will get points from the Trumpanista camp for bashing California. When I wrote Blue Frontier: Saving America’s Living Seas, at the beginning of this century, I was worried. Industrial overfishing for the global seafood market, oil, chemical, nutrient and plastic pollution, loss of coastal habitat needed for restoration, plus the emerging signs of climate change, were reaching critical mass. Still, I saw the challenges as ultimately solvable if we just mobilized the political will and professional expertise needed. As heartening as the emergence of the Green New Deal as a political rallying cry and litmus test of sorts for the early field of Democratic presidential candidates is, the predictably negative response in other quarters is equally dismaying. Of course, the most obvious naysaying comes from the Republicans and the rightwing media following the lead of a president who suggests that snowstorms and cold weather are evidence that climate change isn’t happening. Shopping for groceries can be overwhelming. Once you get past the sheer volume of products staring down from the aisles, you’ve got to reckon with their ingredients, prices, and the way the food is packed. For environmentally conscious shoppers, the latter—excessive packaging and the resulting pollution—is especially irksome. Enter the zero-waste grocery store. These small-but-budding enterprises are increasingly popping up, and they’re promising plastic-free, packaging-free products ranging from grains and produce to detergent and shampoo. The original zero-waste grocery story was the late in.gredients in Austin, Texas, which unfortunately shut down last April after five years of selling exclusively (un)packaged and locally sourced food. The introduction of HR 109, Recognizing the duty of the Federal Government to create a Green New Deal supporting the vision of a more just and sustainable path for the country has shifted the conversation about climate change simply by pointing out the need for a comprehensive approach. Assemblyman Todd Gloria announced introduction of Assembly Joint Resolution (AJR 7) urging Congress to pass a Green New Deal. If passed by the California State Legislature, this will put California officially on the record in support of the recently introduced federal legislation. Do you remember how hot the ocean got this past August at the beach? During the first week of that month, Scripps Pier recorded 3 days of warm water that set records. On Wednesday, August 1, Scripps Pier recorded the highest ocean surface water temperature in its 102 history of taking measurements. The water temperature was 78.6 degrees. According to the National Ocean and Atmospheric Administration, the “normal” August average water surface temperature at the pier is 68 degrees. Then, that Friday – and for the second time in the week – the ocean temperature reached an all-time high at Scripps Pier in La Jolla, hitting 78.8 degrees. On Sunday, the sea surface temperature hit 79.4 degrees. Scientists at Scripps have been taking daily measurements at the pier since 1916. The year 2018 was the hottest year for the planet’s oceans ever since record-keeping began in 1958, according to a worrisome new study from international scientists. Luckily, job-generating renewable energy now has become competitive with or cheaper than most forms of fossil fuel. Progressive democrats are also calling for a Green New Deal that aims to transition the U.S. economy to clean energy, addressing both climate change and inequality. It’s time to call in the Marines, and also the Army, Navy, Air Force and Coast Guard to respond to the growing number of climate-linked natural disasters. When it comes to national security, no threat compares to our changing climate and its intensification of hurricanes, wildfires, heat waves and other natural disasters. If the rise of Nazi Germany and the nuclear balance of terror with the Soviet Union were the major strategic threats to overcome in the last century, climate change is the major challenge of this one. Nuclear Shutdown News chronicles the decline and fall of the US nuclear industry and beyond, and highlights the efforts of those who are working for a nuclear free world. Two nuclear power plants closed permanently in 2018. Fort Calhoun in Nebraska closed for good in in October, after clanking on for 43 years. And previously, the nation’s oldest nuke plant, New Jersey’s Oyster Creek ceased running after 49 years in September. US commercial nuclear plants were designed to operate for 40 years. These two nuke plant closures brought the remaining number of the nation’s nuclear plants still (sometimes) running to 99. What do beer, oysters, table salt, air & tap water have in common? They’re all ways humans are ingesting microplastics, tiny bits of plastic waste ubiquitous in oceans, lakes and rivers and even soil and air. Wildlife as diverse as whales, seabirds, fish and zooplankton are polluted by ingesting plastic debris. It’s naïve to assume that humans, sharing the same global environment and eating at the top of the food chain, are magically spared contamination from plastics. Though no one has yet measured how much plastic pollution humans actually carry around, there’s plenty of evidence we’re taking the stuff in, by eating, drinking and just breathing. Between the devastation of Mexico Beach, Florida and Paradise California plus the 4th National Climate Assessment Report, the year 2018 may become known as the point of no denial, an acknowledgement of what Governor Jerry Brown calls, “the new abnormal.” At this point climate deniers are being recognized as little more than the willing tools of the fossil fuel industry such as the coal lobbyist now running the EPA. 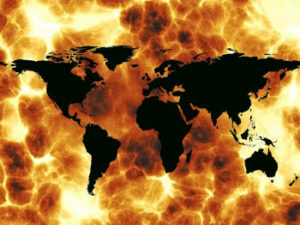 The best available science reflected in the federal report prepared by 13 government agencies including NASA, NOAA and the National Science Foundation, suggests the worst possible scenarios if we continue on our present course (which we appear to be with 16 of the 17 hottest years on record occurring since 2001). We live under oligarchy. Yes, we have elections, but the interests of a tiny opulent minority are far better represented in our government than the concerns of the vast majority of Americans. The good news from the scientists is that the 1.5-degree goal may still be attainable. That’s unlike what most scientists thought when the 2015 Paris climate agreement included 1.5 degrees as an “aspirational” goal. It’s a sad fact of our Californian recycling world – China no longer wants our trash. China used to be California’s — and the world’s — largest overseas market for recyclables, but in January, China began not accepting “contaminated” material it once brought to its shores. For China, now, if the recycled material is one-half of 1% contaminated, it’s too impure for recycling. Back in 2017, Recology was getting $100 a ton for newsprint. Now they are averaging about $5 a ton.